Quarter, half, and whole beef shares available. 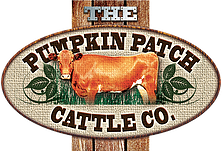 By supporting The Pumpkin Patch Cattle Company, you can ensure the quality of your beef. The Pumpkin Patch Cattle are raised on Sauvie Island and our beef is grass fed, all natural, with no hormones and no additives. Visit our website for more information.